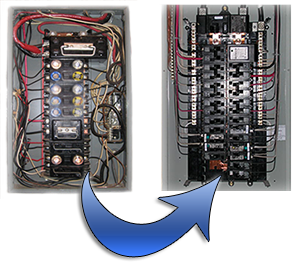 The electrical panel is an electrical service steel box that occupies numerous circuit breakers that are connected to circuits that transfer power throughout the house and distributes electrical current to various subpanels within your house. The electrical panel of your house is the core of your entire electrical system and an eminent link to the electrical grid outside. An electrical panel is also known as a service panel or breaker panel. It also consists of circuit breakers or fuses that protect the circuits from tripping that can be caused during distribution of power to the house. Every electrical appliance has a certain life and when it comes to electrical systems in your house they tend to slow down with time. This is why you need to upgrade them in order to extend their activity. The electrical panel mounted in your basement or garage may contain components that might have been deteriorated with time. You can plan on upgrading your electrical panel if it needs more circuit breakers or fuses. You will either have to replace the old electrical panel with a new one or add a sub-panel to it. Upgrading electrical panels will require modifications, maintenance and rebuilding using top quality technical devices. Phoenix electrical panel upgrades are affordable and they are a real investment because it will last for a long period of years until you need another upgrade. Contact a company that has certified electricians who can inspect your electrical panel and upgrade it accordingly. Your Phoenix Electrician is a full service electrical contracting based in Phoenix Arizona. Phoenix Electrical Panel upgrades ensure that your electrical panel is not overstrained due to increased energy demands, power surges or outages in your house. Electrical panels need to be upgraded because there is high risk of electrocution or complete blackout of your house. This can be a real concern for your family and you need to act immediately by calling in skilled professional who can install Phoenix Electrical Panel upgrades and taking safety codes and regulations into consideration. If you have a “screw-in” style fuse panel then you will certainly need an upgrade because these electrical panels used to installed in older Phoenix homes and were quite common back then. They work well but there has been change in the consumption of electricity in our houses now. These screw-in style fuse panels are not considered appropriate this is why they will need to be upgraded. If your circuit breakers constantly trip even if you don’t use an old version of an electrical panel even then you will need Phoenix Electrical Panel upgrades. If your breakers are getting short due to over current and your lights are flickering, or you are not able to use more than two appliances at a time then it is likely that you need an upgrade. So make sure you get a comprehensive evaluation of your electrical panel by Your Phoenix Electrician in Phoenix Arizona.